Our residential roofing and complete home insulation company has the reputation for being among the best serving the Dallas & Fort Worth areas. Our clientele is well-aware of our commitment to an excellent customer experience as well as our comprehensive product knowledge and diligent project execution. We are prompt, dependable, reasonable, and professional and a quality reputation we have achieved is one that we value and continually pursue. 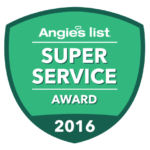 Because of our exceptional work ethic and reliably outstanding customer service, we have been recognized by the Better Business Bureau as an A+ business, by Angie's List as a Super Service provider, and by Owens Corning as a Certified Energy Expert Professional. If you need residential insulation or roofing repair service for your home and would like to experience first-hand the excellent customer service of working with Dimensional Contracting, start today with a free (no cost, no hassle) estimate!